One of the most famous of all Australian films is Smiley, produced in 1956 and starring the child actor Colin Peterson and veteran Chips Rafferty. It tells the story of the adventures of a young larrikin boy in a small country town. Smiley performed well at the box office in Australia and was released internationally in the United States, United Kingdom and elsewhere, including France. The film is now considered a classic of the Australian cinema. Its popularity gave rise to a sequel staring Peterson and Rafferty and called Smiley Gets a Gun (1959). This was likewise released internationally. Boris Grinsson, Purdu dans la Brousse [Lost in the Bush aka. Smiley], poster, lithograph, 47 x 63 inches / 120 x 160 cm, 1957. For the French release of Smiley in 1957 - therein titled Perdu dans la Brousse [aka. Lost in the Bush] - a poster was designed by renown graphic artist Boris Grinsson (1907-1999). Grinsson worked in the field of French move poster design from the 1930s through to the 1970s and produced over 2000 individual movie posters. He worked during a period in which the art of movie posters was at its peak, and prior to the adoption of photographic and digital montage as the primary content of such works. His Smiley poster is an exemplary piece of work, both in regards to graphic design and printing by the stone lithograph process. Boris Grinsson was prolific as a movie poster artist. His style was very much painterly, using flat blocks of colour and simple, yet superb draughtsmanship in the drawings he produced for local film distribution and production companies. He favoured simple, multicoloured lithography in the production of his work up to the late 1950s, as opposed to the more more photolithographic process which could accommodated photographs and a wider range of true-to-life colours. His posters therefore take on more of the look of unique works of art, rather than mere artificial reproductions. Lithography was a process which saw a high level of application and sophistication in France, having been largely invented and refined there in the 1820s. Lithography was a process which was closer to the artist than more modern forms of printing, as it allowed original drawings to be transferred directly to the lithographic stone for printing. Its use had been popularised by artists such as Toulouse la Trec and Jules Cheret in their posters for the Moulin Rouge and other Paris venues during the 1890s. Grinnson's work was therefore a continuation of this tradition, allowing the artist to apply a simple colour palette over a precise drawing. Every poster printed in the lithographic manner was in some way unique, as the various layers of ink were applied by hand and in accordance with the registration marks on the lithographic stones. Spills and misalignment are evident in many such posters, though they do not necessarily detract from the work. Such posters were not produced by a machine, but by individual printers, and as such bear contain both a warmth and intensity which machine-prints do not. The French became expert in printing large movies posters after 1945 using stone lithography. As a result, movie posters printed in this way can sell for a premium. Stone lithography was also used in Australia through to the 1960s, though the quality of the artwork work was generally not up to the French standard and the colour palette was often limited to red / yellow / black. By the end of that decade stone lithography had generally been replaced throughout the world by machine-based photolithographic and offset printing processes. With the move from stone to photolithography the painterly element largely vanished, though Russian movie posters had used photolithography to produce movie posters which featured simple, dynamic graphic design elements and reproductions of drawings and paintings through to the 1960s. Boris Grinsson, Gaslight , poster, lithograph, 1946. 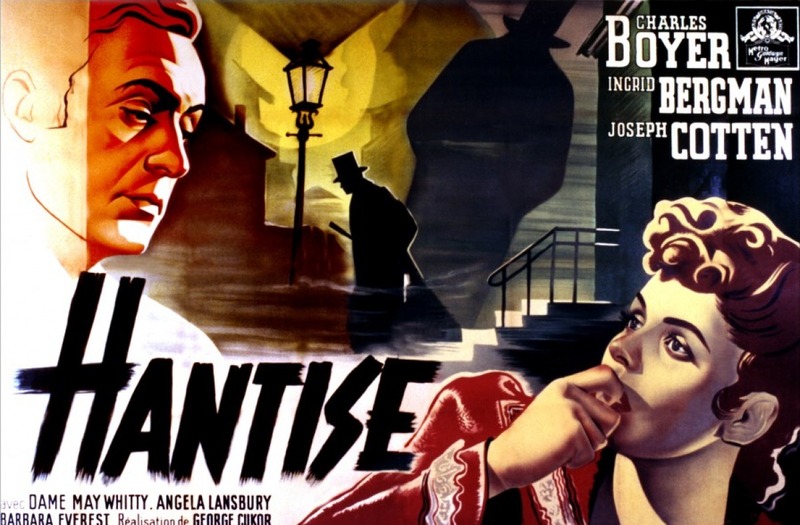 The artistry of a Boris Grinsson poster is seen, for example, in the 12-sheet poster produced for the 1944 Hollywood film Gaslight, starring Charles Boyer and Ingrid Bergman and released in France during 1946. The poster is s superb example of the ability of the lithographic process to add facial texture and background shadow whilst also blending a complex colour palette. In that example it ranged across the poster from orange and yellow through to red, brown and cream, with black highlight. Lithographic posters usually contained 2-3 colours, apart from black, though blending and mixing was common.As a result of both Grinsson's skill as an artist and the quality of his posters as printed, he is rightly considered one of the best and most collectible of French film poster artists. He ranks alongside the Italian Anselmo Ballester who worked during the same period and drew in a similar, though more painterly and figurative manner. Ballester's work was reproduced using photolithography, as opposed to the stone method favoured by Grinsson. The work of European graphic artists such as Grinsson and Ballester was in stark contrast to the posters coming out of the United States at the time which, in most cases, were photographically prepared and offset printed, utilising stills from the film and a often a standard set of fonts. As such they were rather bland, artistically, when compared to their European equivalents. Grinsson's work was in many ways similar to the general style of post-Constructivist posters coming out of Russia from the 1930s through to the 1970s. They were mostly flattish painted drawings, using a muted colour palette. In stark contract was the work of Polish and Czech artists in this area after 1945, with decidedly Surreal and Modernist influences evident. 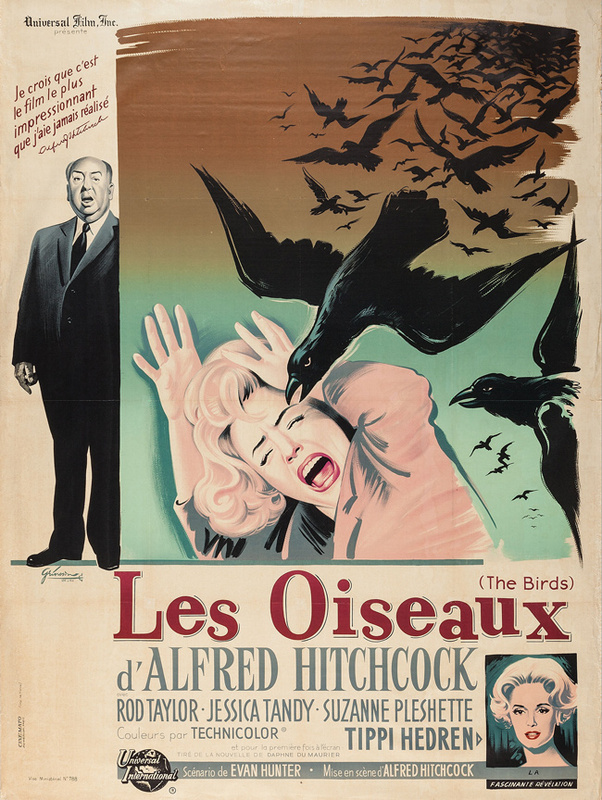 Boris Grinsson, The Birds, director: Alfred Hitchcock, 1963. Boris Grinsson, Wikipedia [webpage], available URL: http://en.wikipedia.org/wiki/Boris_Grinsson. Accessed 24 February 2014. Boris Grinsson - l'homme aux 2000 affiches, [webpage], available URL: http://www.ruedescollectionneurs.com/magazine/mag/grinsson.php. Accessed 24 February 2014. Segura, Jean, Boris Grinsson, Stanislas Choko Collection. 'The Two Lives of Colin Petersen', Hinterland Times, 5 September 2011, [webpage], available URL: http://www.hinterlandtimes.com.au/2011/05/09/the-two-lives-of-colin-petersen/. Accessed 24 February 2014.